Facebook Cover Photo is the best way to express yourself or your brand because “A picture is worth a thousand words” and your Facebook Cover Photo is the first thing people will notice on your Facebook Page. For some, a Facebook Cover Photo is just a picture on top of their Facebook Page but others consider it seriously to market their brand. A perfectly designed Facebook Cover Photo will always help your page get more likes and push people to share your page with others among their network thus increasing your brand value. Now you know the importance of your Facebook Cover Photo and excited to design your next Facebook Cover Photo , We like to share our tips and tricks to create your own Facebook Cover Photo that will look eye-catching and perfect. To avoid scaling and cropping of your Facebook Cover Photo the exact image dimension of your Facebook Cover Photo should be 851px X 315px. For more information please check this Facebook Picture & Cover Photo Dimensions from the official page. Ever wondered why your Facebook Cover Photo is blurry and pixelated although you uploaded your Facebook Cover Photo in correct dimensions that’s because of the image size. Make sure your Facebook Cover Photo is under 100KB or else Facebook will automatically optimize the image making your image blurry and pixelated. To save the image optimized you can use Photoshop “Save for Web & Devices” Feature which will give you live preview of the image size and quality. Always read Facebook Guidelines and follow them to avoid risks of Facebook taking your page down violating them. Although you have lots of space to design your Facebook Cover Photo but never forget that your Profile Picture will be on top your Facebook Cover Photo hiding part of your Facebook Cover Photo so please keep that space clear as it won’t be visible to anyone. Design your Facebook Cover Photo with passion and keep it consistent with your brand, use eye catching imagery with solid headline that freeze people to see it. 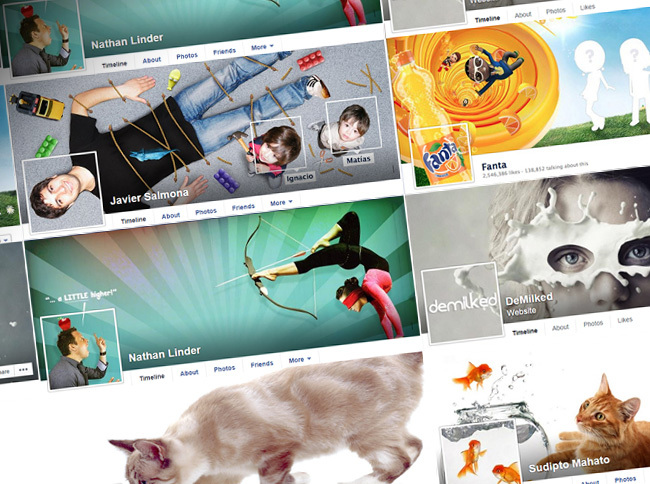 Be creative and create seamless Facebook Cover Photo along with your Facebook Profile Photo. Make use of holidays, seasons, offers & discounts to change your Facebook Cover Photo corresponding the topic. Add call-to action to promote your apps, offers & free downloads.